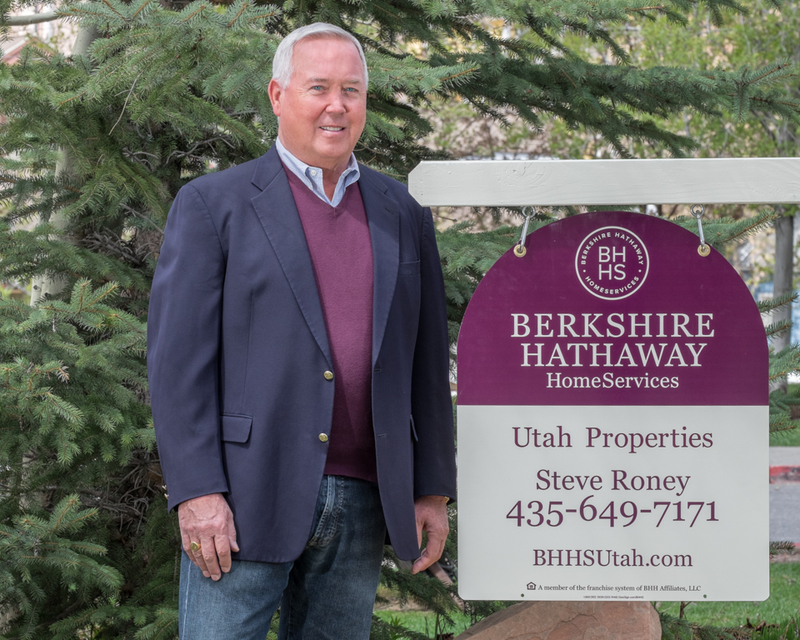 As we draw closer to our June 3rd conversion to Berkshire Hathaway HomeServices (BHHS) Utah Properties, our anticipation continues to build, and we are thrilled to join the "Most-respected Company in the World," according to Barron's famed annual survey. To share the Berkshire Hathaway name is a tremendous honor. Already, clients and friends of our agency have expressed heartfelt congratulations over our allegiance with Warren Buffet--the man, the myth, the only person to beat the market...again and again. Finding the right flag for our agents, not just in name but also in character, was very important to me. 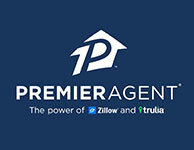 As an owner, I am always asking, What can I do over time to improve our supportive offerings to agents? When weighing the brand, I recognized that we needed some of the characteristics of Prudential, but we also needed a brand that was both fresh and established in the business community. Berkshire Hathaway HomeServices was the obvious choice. Not only does Berkshire Hathaway have a long-standing track record of stability and integrity in real estate as a dominant industry investor, the company managed to build a brilliant new agency network that has all of the accountability of an established brand, without any of the excess or history of bad judgment. Coming after the recession, we believe that the Berkshire Hathaway brand will inspire confidence and trust in buyers and agents. Steve Roney adds, "Real Estate, frankly, has not been a stable business, but Berkshire Hathaway managed to maintain its balance and credibility during and following the 2008 crash. That says something about its integrity and business intelligence with regards to real estate. I could not think of a more sound foundation for a brokerage." 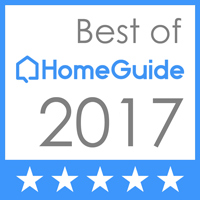 Already, the BHHS network has been named the "Real Estate Agency Brand of the Year" by the 2014 Harris Poll and has garnered considerable attention domestically and internationally. While we are already on a trajectory of growth, our new brand will increase international buyer interest, offer agents the very best in cutting-edge marketing technology, and help us build on our history of success. We hope you are as excited as we are to start seeing the new "Cabernet and Cream" yard signs around the state. Follow us on Facebook as we launch Berkshire Hathaway HomeServices Utah Properties. Thank you for your loyalty and support. Warren sends his regards! Posted in Uncategorized | 0 Responses to "The Most-Respected Company in the World Joins Utah's #1 Real Estate Agency"
Sales of Previously Owned Homes Rose in October; Supply of Properties Shrinks Sales of previously owned homes were stronger than expected in October, putting them on track to hit their highest annual level since 2007. Existing homes sold at a seasonally adjusted annual rate of 4.79 million units in October, the second-highest level of the year and up 2.1% from September, the National Association of Realtors said Monday. October's level represented a 10.9% gain from a year earlier and was the 16th consecutive month of year-over-year home-sales gains. Prices are rising amid sharp declines in the number of homes listed for sale. Just 2.14 million homes were for sale at the end of October, down 22% from one year ago to the lowest level in a decade, according to NAR estimates. With more buyers chasing dwindling inventories of homesand, in particular, fewer foreclosed properties that sell at steeper discountsprices are beginning to rise in more markets. The national median home price rose by 11.1% from one year ago in October to $178,600, according to the NAR. "We are clearly in recovery," said John Burns, chief executive of John Burns Real Estate Consulting in Irvine, Calif. At October's sales pace, there were just 5.4 months of supply. That was the lowest level since February 2006, which was before housing markets began their prolonged decline. One-third of homes sold in October had been on the market for less than a month, according to the Realtors' group. According to The Wall Street Journal's quarterly survey of housing-market conditions, inventory levels of homes for sale have fallen in all 28 metropolitan areas tracked in the survey. At the current pace of sales, there was just one month of supply in Sacramento, Calif., where inventory fell by 56% from one year ago. The months' supply stood at 2.4 in Phoenix, 2.8 in California's Orange County, 3.2 in San Diego and San Francisco, and 3.6 in Los Angeles. Housing demand began gaining pace a year ago as prices in many hard-hit markets had fallen so far that investors began scooping up homes at substantial discounts. Rising rents have encouraged many such investors to rent out the houses, rather than putting them on the market and trying to flip them for a profit. More recently, demand among traditional buyers has jumped amid continued declines in interest rates that have made homes, based on monthly mortgage payments, more affordable than at any time in at least 15 years. The Mortgage Bankers Association said loan applications for home purchases rose 22% in the first week of November from one year earlier. Median home prices have now risen for eight consecutive months, which last occurred in early 2006, just before the housing bubble burst. In part, that reflects an increase in sales of more-expensive homes. Sales of homes priced below $100,000 fell by 0.6% from one year ago in October, while sales of homes priced between $750,000 and $1 million rose by 53%. Craig Moll, of Clearwater, Fla., said his biggest hurdle in buying a home was that there "weren't many to choose from." Mr. Moll sold a townhouse in 2009, as the housing market deteriorated. "Over the course of about a month, the entire opposite side of the street turned into rentals as the market started to crash," he said. Now, with mortgage rates at historic lows and home prices "creeping back up, it felt like our time to buy something," he said. This summer, he paid $340,000 with a 10% down payment for a four-bedroom home with a swimming pool in Clearwater. "It wasn't a great deal. It was a good deal," he said. Still, housing markets face headwinds, including stringent mortgage-lending standards. Mr. Moll, who is self-employed and advises insurance companies on weather-related car damages, said getting approved for a mortgage was "very, very difficult." The Realtors' group also warned that November's home sales could drop due to Sandy, the superstorm that battered the Atlantic coast from southern New Jersey to New York's Long Island and Connecticut, at the end of October. Some buyers already have pulled out of sales agreements while other homes that were under contract must be re-inspected or repaired before banks will finance loans. Compared with September, home sales fell by 1.7% on a seasonally adjusted basis in the Northeast; that contrasts with gains of 4.4% in the West, 2.1% in the South and 1.8% in the Midwest. Another wildcard: Whether Congress avoids the "fiscal cliff," a series of tax increases and spending cuts set to kick in at year-end, which some real-estate agents worry could undercut consumer confidence, potentially deferring some sales. A version of this article appeared November 20, 2012, on page A3 in the U.S. edition of The Wall Street Journal, with the headline: Housing Market Posts Gains. Posted in Uncategorized | 0 Responses to "Housing Market Posts Gains"
OMAHA, Neb. (AP)  Warren Buffett's company is buying a real estate franchise from Prudential and Real Living and launching a new brokerage brand for those agents. Berkshire Hathaway (BRK.A)(BRK.B) said Tuesday it is acquiring Prudential's real estate agent network from Brookfield Asset Management. Berkshire and Brookfield will start Berkshire Hathaway Home Services next year and begin switching agents to the new firm. Buffett said he's happy to lend Berkshire's name and financial strength to the new company, which will be based in Irvine, Calif., and be led by a team of executives from Prudential Real Estate. "I am confident that these partners will deliver value to the residential real estate industry, and I am pleased to have Berkshire Hathaway be a part of the new brand," Buffett said in a statement. Posted in Uncategorized | 0 Responses to "Warren Buffett Buys Prudential Real Estate Unit"
3 Strategies To Find Satisfaction and Purpose in Life. I've long thought that conceptualized real estate decision-making -- the intention and strategy that underlie our choice of location, mortgage, price point and property type -- is the ultimate exercise in lifestyle design. The place we live is inextricably intertwined with our relationships, our work and how we spend our leisure time, both impacting and being impacted by all these areas of our lives in innumerable ways, some of which we can't even anticipate until the web of impacts have begun to be spun. This web is why I so often encourage homebuyers to write out, journal or otherwise lay out their holistic vision of the life they want to live after they move into the home they are about to hunt for, before drilling down into the minutiae of bedrooms, bathrooms and square feet. And this web is beautifully detailed in the new, third edition of the international best-seller "Repacking Your Bags: Lighten Your Load for the Good Life" by professors and coaches Richard Leider and David Shapiro. This is by no means a book about real estate; it is a book about how to compose and recompose a fulfilling, inspired and plain old "good" life, as often as you need to, throughout your lifetime. In fact, part of what is unique about "Repacking" is that the authors have written three editions of it over 20 years, and comment transparently throughout about how the philosophies, tools and systems contained in "Repacking" have evolved as they have lived their own "good life" journeys. But Leider and Shapiro provide a succinct definition of what the good life is, and home is an essential element: "living in the place you belong, with the people you love, doing the right work, on purpose (emphasis added)." The whole of "Repacking" is devoted to helping readers unpack and repack these four elemental "bags" that we all carry through life with a framework that helps us to carry no more and no less than what makes us happy at the various transition points in our lives where we crave to figure out what's not working and course-correct. 1. Reboot. First-gen repackers were often prompted to rethink things by a midlife crisis; now, say Leider and Shapiro, people repack early and often, throughout their lives. But our busyness makes it difficult to stop, seek and find meaning while we're on the treadmill the authors call "hurry sickness -- always going somewhere, never being anywhere ..." They encourage readers to reboot their lives by taking a 12-hour media fast, consuming no TV, radio, Internet -- not even using the phone -- for half a day, instead devoting that time to consider some key questions about our relationships, our lives and our purpose. The next step, for those who dare take it, is a 24-hour vacation from speaking. For both steps of their "reboot," Leider and Shapiro offer "purpose points," "core questions" and "repacking reflections" that readers should examine to take full advantage of these self-imposed time-outs. 2. Resharpen your growth edge. Unique to this edition is Leider and Shapiro's repeated call to readers to reinvent and repack their bags, not just out of ennui, but in order to keep up with the rapid changes in the workforce and marketplace. They write, "[i]f the rate at which you're learning is not equal to or greater than the rate of change today, you'll soon be obsolete." The authors encourage readers to conceive of their personal development as just as essential to thriving as a company sees its research & development initiatives. Ideally, "Repacking" involves constantly exploring new opportunities and building new skills, always looking to learn something new that excites you. 3. Reframe. Leider and Shapiro urge readers to reality-check themselves on how they are "spending two of (their) most valuable currencies: (their) time and (their) money" by sitting down with their actual calendars and checkbooks and asking themselves how satisfied they are with where these resources are going. If you find yourself spending either on things you wouldn't deem priorities, then it might be time to repack in one or more area(s) of your life. I've seen homebuying impact adult children's relationships with their parents, when the son or daughter accepts a down payment "gift" that is given with many, unspoken strings attached. And I've seen a previously fearful homebuyer grow more assertive than ever before in pursuing the lifestyle of her dreams, starting a new business and traveling the globe, emboldened by her success at this complex, daunting transaction. Posted in Uncategorized | 0 Responses to "3 Strategies To Find Satisfaction and Purpose in Life." Median home prices for existing single-family homes rose 10.2% in the year ending August. This is one more (and impressive!) indication that the housing market is recovering. The chart above shows the prices in constant dollar terms, and they are up 8.4% in the past year. The chart also suggests that housing prices in real terms have found solid support at levels reached earlier this year. 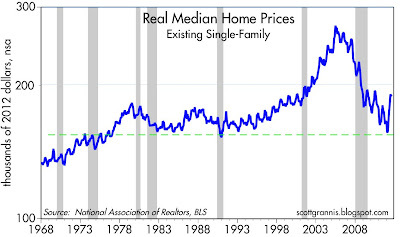 Mark Perry has charts and data for median home prices for new single-family homes: "The median sales price for new homes surged by almost 17% from a year earlier to $256,900 in August, the highest median price since March 2007." The housing market news is getting to be pretty impressive. Posted in Home Prices | 0 Responses to "Housing Update: Median prices for existing single-family homes rose"
Since the recession, sliding property prices have made Americans feel less wealthy and less willing to spend on everything from home renovations and appliances to restaurant meals. That weighs on the recovery, because consumer spending fuels two-thirds of the nation's economic activity. With real-estate values now risingand housing chalking up more gains recently in sales and constructionAmericans are seeing their critical assets rise in value as their disposable incomes also climb. That helps in rebuilding wealth and makes even heavier debts more manageable. Rising home values are "very helpful," said Harm Bandholz, chief U.S. economist at UniCredit Bank, who estimates that stabilizing home prices could boost America's gross domestic product in 2012 by more than half a percentage point. "I think the fundamentals for a stronger pickup in consumer spending are in place." U.S. households' net worththe value of homes, stocks and other investments minus debts and other liabilitiesdropped about $300 billion, or 0.5%, to $62.67 trillion from April through June, the first decline in three quarters. But the drop was driven by financial assets like stocks, which lost around $600 billion in value as the Dow Jones Industrial Average sank 2.5% in the second quarter. During the third quarter, such investments have rebounded. The Fed report also showed that borrowing inched up, with household liabilities, mostly debt, rising 0.1% to $13.46 trillion. The salutary effect of housing-market gains on Americans' balance sheets could reduce the risk of recession, some economists said. Home prices rose 6.9% in the second quarter from three months earlier, according to CoreLogic Inc. Last week, the data firm said that in the first half of 2012, rising prices lifted more than 1.3 million homeowners who owed more on their homes than they were worth above the water line. The Federal Reserve's program of buying $40 billion in mortgage-backed securities a month, announced last week, could further boost housing by keeping interest rates on mortgages low. "The ongoing climb by home prices can only enhance the economic outlook," Moody's Analytics economist John Lonski wrote.This "will help household expenditures grow by enough to contain recession risks." Onno Koelman, a 32-year-old engineer, is among those feeling better about his personal finances and spending more. Mr. Koelman and his wife bought a $525,000 home in Northern California's Marin County in the spring of 2010 and are refinancing their mortgage for the second time. Recent appraisals put their house between $550,000 and $560,000. "It's definitely relaxing," said Mr. Koelman, who works for a firm that serves the drinking-water industry. With their residence gaining value, the couple is spending money on home improvements rather than paying off hefty student debts. "Things are going to get better," Mr. Koelman said. Nick Timiraos contributed to this article. Posted in Home Prices | 0 Responses to "Rising Home Values Repair Balance Sheets"
Welcome to my new website! I am very pleased to introduce the newest and latest real estate searching and viewing technology incorporated in my site. Browse for anything you are looking for and then contact me to get a private showing of any of these magnificent properties. I look forward to hearing from you! 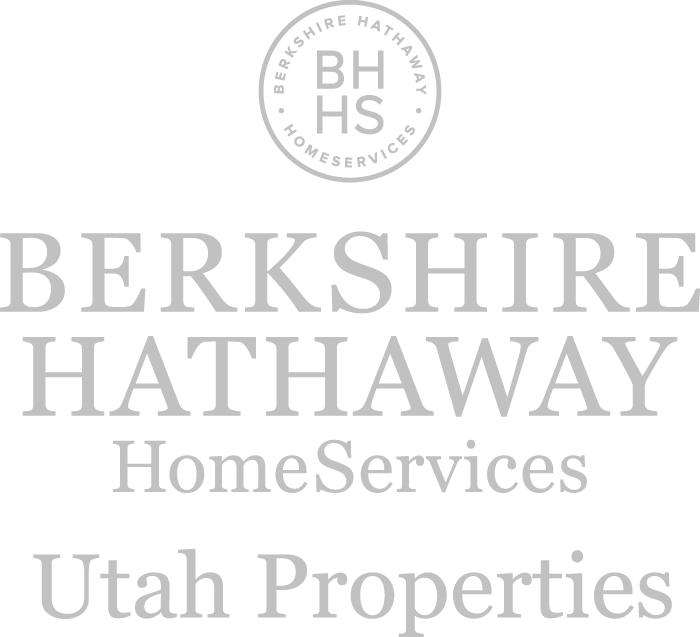 Posted in Uncategorized | 0 Responses to "Welcome To My New Website!"